DEATH and DRAGONS by Deadspace66 - Transparency Fix You need it in the first place to use mods. Hashirama sage mode(face paint) you need to install this to use any mod for Sekiro. Minimal HUD (Customizable) Required for the game to load modified files. Native PS4 Buttons Easiest way to do game file replacement, which this mod requires. Remove Annoying Sounds Required for the game to load modified files. Shinobi of the Cherry Blossom Make sure you have this in your Sekiro folder, and a 'mods' folder with the sub folder 'parts' inside. This is where you will put this mod. Subtle Visual Effects and Kanji Required for the game to load modified files. If you have special needs with mod engine, feel free to contact me. Otherwise mod owners should refer to here for mod engine as it will always have the latest version to work with the latest Sekiro patch. Fix pathing issues that caused missing asset issues some users experience. Improve performance of hooked functions. * Add new hook for file loading. This should fix issues with missing assets some users have experienced. * Fix issue where some people may see flickering menus or other issues. * Make debug logging less chatty if you don't have it enabled. Add new AOB scanner instead of hardcoded offsets, which makes Mod Engine more likely to work on future versions of Sekiro or modified Sekiro exes. Mod Engine still doesn't officially support such exes, and is not guaranteed to work with them. Mod Engine now supports chain loading other dlls that may also override dinput8.dll. Look inside modengine.ini to configure this. Add checks for Sekiro exe version that disable mod engine due to an incompatible version. This prevents the game from crashing due to using Mod Engine with an incompatible version of the game. The prompt will direct you to this page to download the latest version, which will be updated to be compatible with new Sekiro patches. 2. 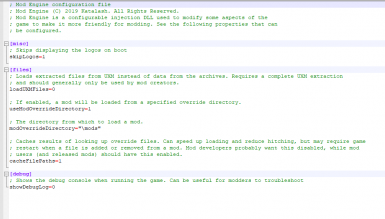 Extract or copy the files for the mod you are installing to a unique new directory in Sekiro directory. 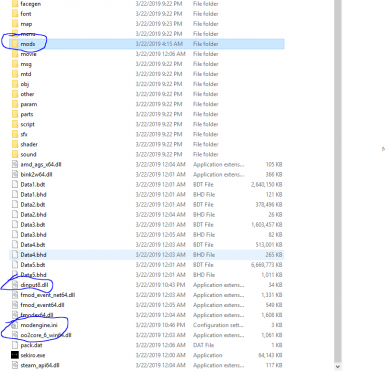 For example, if installing cosmetic mods, you should create a directory called "mods" in Sekiro and copy all the files (parts, msg, map, event, etc) into that directory. 3. Open up modengine.ini and modify the modOverrideDirectory parameter to the folder you installed the mod into (a '\' character is required currently). This defaults to "\mods" but you can change it to something else if you wish. 4. Enjoy your mod. If you want to play a different mod, change the modOverrideDirectory setting to point to a different folder with a different mod. To uninstall, delete or rename dinput8.dll. * If you have experienced missing assets, please update to 0.1.10. I should have fixed this issue for good this time by rewriting a lot of the path resolution logic to be more flexible. * Ultrawide and fps unlocked exes are not supported and may not work. The recommended way to unlock your fps and enable ultrawide is to use this mod: https://www.nexusmods.com/sekiro/mods/13. This does not require exe modification and is compatible with mod engine.